Hero MotoCorp has added one more Scooter in its line up. Hero launched the Hero Destini 125 in India at an attractive price of ₹ 54,650. Hero Destini 125 is powered by 125cc Energy Boost Engine which produces maximum power of 8.7 bhp @ 6750 RPM and maximum torque of 10.2 Nm @ 5000 RPM. 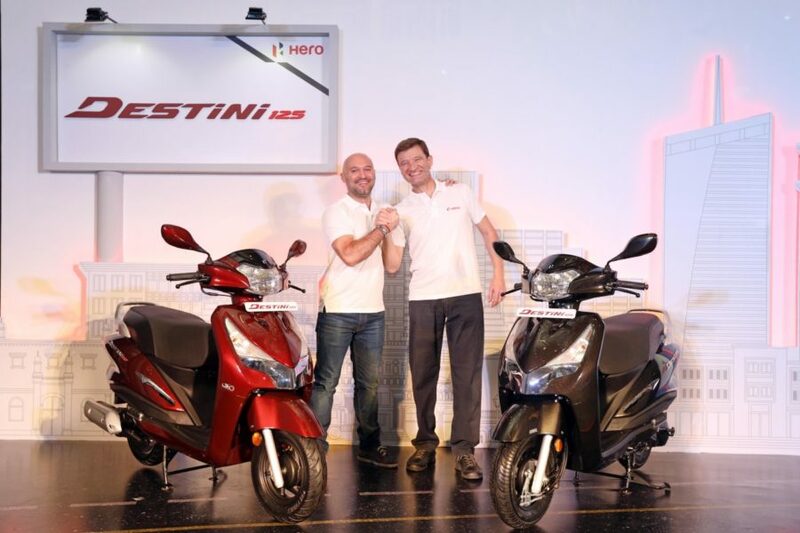 Hero brings the i3S (Idle-stop-start system) to the Destini scooter for the enhanced efficiency. Other features include Digital-analog Speedometer, Side Stand Indicator, External fuel filling system, Remote key opening, Mobile charging port, and Boot light. The Destini 125 is designed for the young metro audience, it comes with metal body with a bold premium chrome chest, signature tail lamp, winker side chrome garnishes, stylish cast wheels, new body color mirrors and a dual tone seat cover.